Caribbean Rum is very much a western invention. Christopher Columbus brought with him stocks of sugar cane on his second voyage to the Americas in 1493 and planted them on the island of Hispaniola (what’s now the Dominican Republic and Haiti). The climate and soil were ideal for these plantings, and quickly sugar cane became a bumper crop in the region. It was in Barbados where the leap between this Caribbean sugar cane and rum really first happened, and it would prove to be one of the major defining events in the Caribbean. Of the islands in the Caribbean where rum is made, Barbados has always shown a high level of aptitude for making good rum with brands like Mount Gay, Plantation, and Cockspur all producing consistently solid rum. 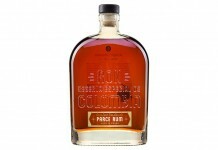 Cockspur Fine Rum (40% ABV / 80 Proof, $18) – while there is no age statement on this rum, from the color and palate we’d guess it’s a blend of predominantly rum that’s only 3-4 years old, but with clear impact of the oak barrel. Vanilla and brown sugar combine with a dusty oak and clove to make a nose that’s slightly sweet and spicy. The entry is fairly light and slightly thin with vanilla, butterscotch, pineapple, and honeysuckle combining with black pepper, clove, and cinnamon. In the midpalate the oak barrel starts to shine though with some nuttiness, dusty oak, and a little earthiness. There’s a touch of citrus that comes through in the midpalate that ramps up for the finish. The finish of Cockspur Fine Rum is a little hot and dry with the citrus notes combining with black pepper for a medium long but very dry and slightly acidic finish. Cockspur Fine Rum really isn’t a spirit that does well sipped neat – its dry and slightly acidic finish scream for some dilution, and with ice, the finish rounds out and becomes more affable. Beyond ice, Cockspur Fine Rum is really best suited for mixing; while it does okay with some of the classic citrus-forward rum drinks, its acidic quality can make it difficult to balance out. Cockspur Fine Rum does a much better job as a stand-in for bourbon in many classic whiskey drinks than it does in classic rum drinks. 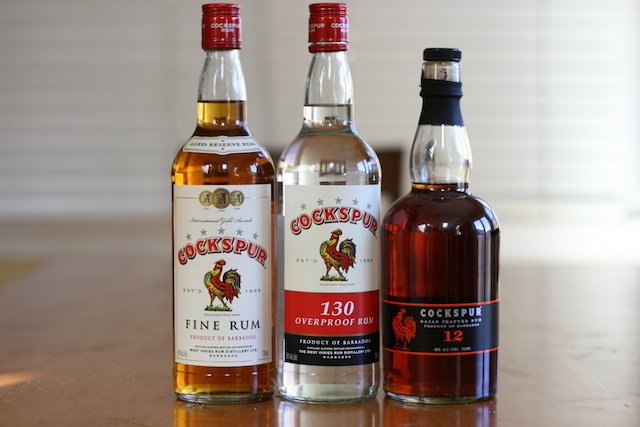 Cockspur 12 (40% ABV / 80 proof, $30) – it’s important to note that although the number 12 appears on the bottle, the label does not state that it’s 12 year old rum. This is an important distinction in the rum world, where 12 may not always mean 12 years (it could just as easily mean 12 different blends of rum, or the 12th expression of rum, or just that they like the number 12). It’s unfortunate, but when dealing with rum, there is no standards board or AOC that governs what gets put in the bottle, so you always have to trust your palate to ensure what you paid for is what you got. From what we understand, and taste, Cockspur 12 is much more an 8 year old rum blended with a wide range of older rums than 12 years old. Regardless of how old Cockspur 12 rum is, the time it has spent in a barrel is exceptionally apparent on the nose. Solid oak leaps out of the glass as the prevailing aroma, joined by caramel, strong cinnamon, clove, and pecan. Like Cockspur’s Fine Rum, it’s clear that barrel impact is a centerpiece of the Cockspur Rum style. The entry for the Cockspur 12 is much softer than the nose, with caramel and oak leading the charge. 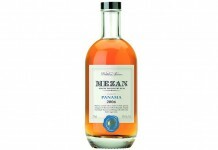 In the midpalate the oak notes intensify and and are supported by black pepper, cinnamon, and clove. The midpalate of Cockspur 12 has a much better balance between sweet and spice, but it’s the spice and oak which really define the finish, which is medium long. There’s a small amount of heat towards the finish, but not nearly as much as with Cockspur Fine Rum. The finish is also slightly dry and far less acidic. Cockspur 12 does a really nice job of capturing the intense flavor of a barrel while still managing to obtain some kind of balance. As with Cockspur’s Fine Rum, the Cockspur 12 should really appeal to whiskey drinkers, especially those who really enjoy tasting their barrel (like with Devil’s Cut). As with the Fine Rum, the dry style of Cockspur 12 is better outside the classic citrus-based rum cocktails and is a nice alternative to bourbon in an Old Fashioned or a Manhattan. For drinkers who think that rum is all about sweet, Cockspur 12 is an excellent example of how rum can also showcase spicy and savory. Cockspur 130 Overproof Rum (65% ABV /130 Proof, $23.99) – it’s interesting that a company whose rums are so barrel focused would put out an un-aged high proof rum. The fact is, the overproof rum space doesn’t have as many offerings, so it’s easier for a brand to stand out. Overproof rum has a number of important functions: it’s a key ingredient in the classic Tiki drink the Zombie, it helps give oomph to tropical drinks that are heavy in juice, and it’s the spirit that you light on fire when you want to add fire to the equation in your drinks. Overproof rum can vary in strength but is most commonly found at the lower end at 125 proof (Wray & Nephew) and at the high end at 151 proof (Bacardi). Cockspur has come in right in the middle at 130 proof. One of the things we like about Cockspur 130 is that it gives you an opportunity to really get a sense of Cockspur’s base spirit. Unaged, the nose is much more vanilla, molasses, mango, and banana than any of the Cockspur aged products. The nose is lush, sweet, and far less fumey or assertive than you’d think at this proof, and it has a very subtle layer of pepper spice that helps balance it out. We expected fire from the entry of Cockspur 130, but instead we got sweet with vanilla, marshmallow, and banana. As it builds towards the midpalate the proof of this rum does really begin to show, but not unpalatably so. The midpalate maintains many of the same flavors from the entry but it brings on a much stronger pepper spice along with some heat. There’s also a nice tropical and sweet quality to the midpalate that counterpoints the spice. The finish is fairly long, very dry, and slightly acidic; it’s here where the spirits’ proof is most apparent. Cockspur 130 manages to deliver many of the elements you want in an overproof rum without getting too fiery or out of hand. Cockspur has managed to find the real sweet spot for their overproofed spirit with a lot of flavor, some good strength, and yet extremely drinkable.